MARCH 2007 -- I regret to announce that I have accepted the resignation of Cynthia Anderson as Pomona Deputy East. Cindy has been a loyal worker at all levels of the Grange and it is with deep sorrow that I accept her resignation. Cindy has assured me she will continue to work for the Grange in any way that she can. As was reported in last months Granger I have appointed Jim Palmer, of Echo Grange, as Pomona Deputy East and to fill his previous position I have appointed Pat Palmer, of Echo Grange, as Quinebaug Deputy. Other recent appointments are Tom Perry, of Senexet Grange, as Junior Deputy of Quinebaug Pomona and Nancy Strong, of Vernon Grange, to the Student Loan and Scholarship Committee. All school’s of instruction have been completed as of now and I thank all who attended them. I hope the presentations that I did help those that attended to better understand the responsibilities of their positions and the different methods, some new some old, of conducting their meetings. As I have stated at all of the schools I am looking for feedback and suggestions on how to facilitate and improve inspections. I have had several suggestions already and will confer with the Deputies and consider them. At the end of each school I gave a short presentation of the National Grange Four Step Program to getting new members. I hope those who heard it will pass along this information to their fellow members. 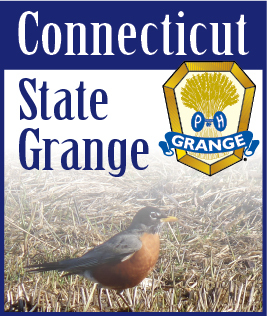 My goal is to slow the decline of members in Connecticut Granges. To do this I have challenged all serious members to try and bring in one new member this year. If you try these methods you may not succeed the first time or the second, but if you keep trying eventually you will succeed. The National Grange Leadership/Membership Director, brother Ed Luttrell will be in the New England area at the end of April this year. We have the opportunity to have him come to Connecticut on April 29 and speak to us about leadership and membership. Along with Joanne Cipriano, our Membership Director, I am finalizing the details for this and when they are finished all Granges will be notified. This may require the re-scheduling of the Pink Sash meeting from the afternoon of the 28th, which normally follows the Camp Berger cleanup, to the afternoon of the 29th. Again everyone will be notified when the details are finalized. There is a lot of work ahead of us in the coming months before we take a short break for summer vacations and everything will be coming at us quickly. If we work together and do our best we will enjoy it and our Grange will be better for it.